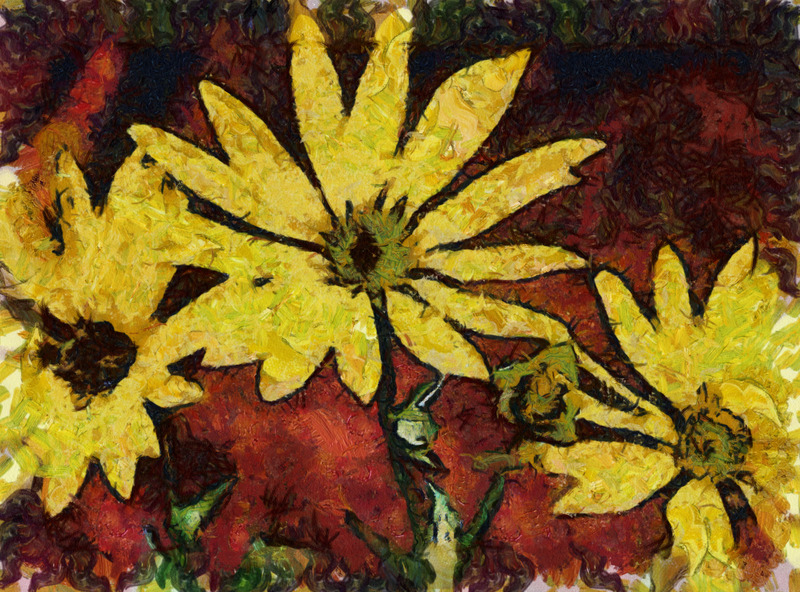 Variants of the Black-Eyed Susan, Rudbeckia hirta, grow wild throughout most of North America, and cultivars are often included in parks and gardens for their brilliant yellow color, often radially streaked with red, and for their ability to attract butterflies. Like her cousin Echinacea purpurea, Black-Eyed Susan has been used by native Americans as a tea to treat upper respiratory infections and flu. As as an infusion it acts as an astringent on the skin, an extract of the roots used as an ear drop treats swimmer’s ear, and as a poultice it has been used to treat snake bites. At the Preakness Stakes (that leg of the Triple Crown run in Maryland, where Black-Eyed Susan is the state flower) a blanket of daisies or chrysanthemums disguised as Black-Eyed Susans is hung on the withers of the winning horse. This ruse is necessary because it wouldn’t do to use any other flower in “the run for the Black-Eyed Susans” (a poke at the Kentucky Derby’s Run for the Roses and a shout-out to Maryland state pride), but Black-Eyed Susans bloom in late summer, and the Preakness runs in May.